made his name with many victories driving production Corvettes. He was well-known for his distinctive "00" racing number and his spectacular power-sliding "tail-out" driving style. MacDonald at Pomona on July 8-9, 1961. 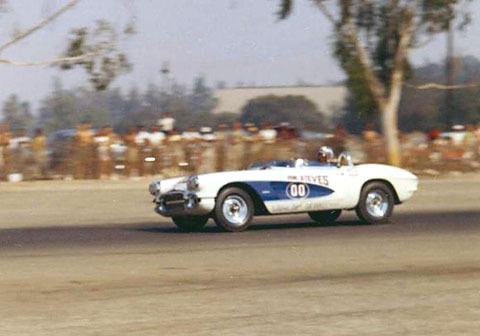 He won both days, defeating a full field of Southern California Corvette drivers, including Bob Bondurant. 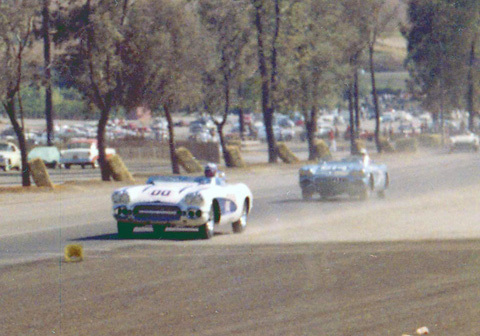 MacDonald leads his Corvette racing rival Bob Bondurant at Pomona. Bondurant finished 2nd to MacDonald both days. Later, the two were teammates driving Cobras for Carroll Shelby. MacDonald led, then DNF'd at Vacaville, August 19-20, 1961. More MacDonald! Photo of #00 winning at Stockton on April 14-15, 1962. One weekend in the 1960's we were testing a new engine during a Vacaville open practice session. Bikes and cars were on the track at the same time, which was kind of interesting. MacDonald and crew had the "00" white Corvette on the straightaway, pushing it wih a pickup truck. They'd get up to about 30mph or so, and Dave would pop the clutch, and the rear tires would lock-up. They did this three or four times until the engine finally fired. I asked one of his crew what was going on, and he explained that they used "zero clearance"on the pistons during rebuilds. This entailed knurling the piston skirts, to the point where they had to soft-hammer the pistons into their bores. They then loaded a sandbag or two into the cockpit next to Dave and had to push the "frozen" engine until it finally broke loose and fired. Strange times."